Whether it’s your child’s math teacher, math tutor or Kumon instructor who has helped build a love of math in your child, sometimes you’ll want to say thanks by buying your child’s math mentor a gift. When I did my stint at the whiteboard teaching math to 11 to 18 year olds, my students would often give me scarves as gifts since they knew I loved wearing scarves with unusual designs, but I also loved the mathy gifts I was given! 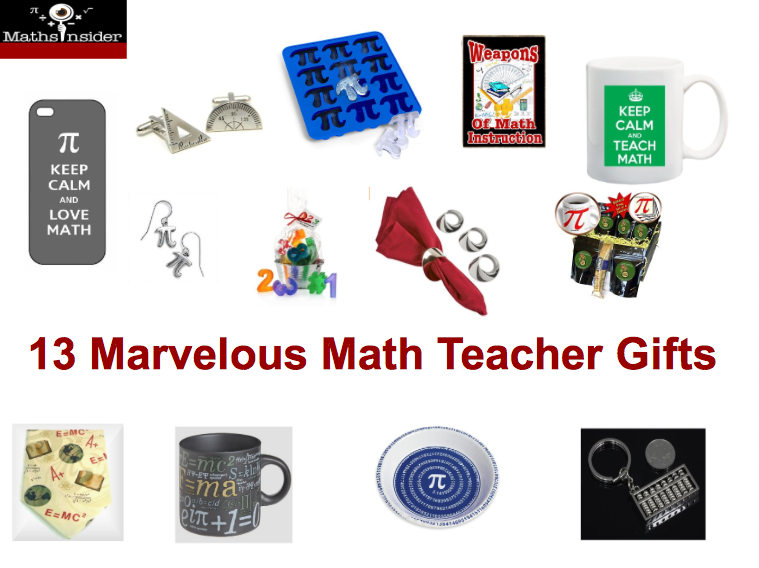 If you’re stuck for math teacher gift ideas, check out these 13 marvelous math teacher gifts, suitable as a holiday gift, an end of year gift or an “I just want to say, “Thank You”” gift. This mug is great for catching out other teacher’s who steal your mug, or at the very least a cool statement of math love (especially if your math teacher actually understands all these equations!) Featuring the Theory of Relativity formula and 19 other formulae to make even the most part-time mathematician look smart! It was a close tie between this Pi ice cube tray, a Pi baking mold, and a Pi cookie cutter, but the “coolness” of this gift combined with the fact that everyone, not only those who love baking, will love making Pi ice in this silicon ice cube tray. These handmade Pi pewter earrings get great reviews on Amazon. Customers talk about not only how cool they look, but also vouch that they’re high quality. They are also small (0.5 inches) which helps math fans make a subtle statement. For a nice discreet gift, take a look at this metal Abacus Keychain. Math teachers can use this for keys or as an ornament for that bag full of math papers that need to be marked by tomorrow. If geometry has been at the forefront of your child’s math learning this year, these metal, chrome finished cufflinks will make a great gift. The cufflinks come in a small velveteen gift box. These multicolored number and symbol soaps are a cute gift for a math or elementary teacher. The 14 soaps come in a gift wrapped, reusable galvanized tub, are hypoallergenic and haven’t been tested on animals. Fridge magnets are a great value gift. This humorous fridge magnet features math formulae, math expressions and math equipment. It also has a glass-like finish embedded with UV protection to protect against fading. This 11oz ceramic mug features a nice reminder (printed on both sides) for math teachers for when the going gets tough in class. This “Keep Calm” mug is both dishwasher and microwave safe. Yet another “Keep Calm” product (yes, as a mom of 4, I am a fan of these!) This black iPhone 5 case has an aluminum outer shell coated with a crystal enamel. A higher priced, high quality gift features rather a lot of the digits of Pi. This 10″ stoneware Pi plate is microwave, dishwasher and also oven safe, so can actually be used to bake pies! Based on the cool one sided math shape, these napkin rings are a classy gift. Made from polished nickel and designed by a German artist, the Möbius Napkins come ready packed in a gift box. This quirky necktie is one of a range of neckties especially designed for school teachers. The math teacher necktie features E=mc² along with various math and science symbols and equations. The whole class loves your child’s math teacher? Try collecting gift money from other families and use the money to by this lovely gift basket. The gift basket is made up of a huge 15oz mug, 4 soft coasters, 5 – small bags of gourmet coffee and a Biscotti cookie. Yum!